WASHINGTON – The outcome of the election won’t be official until next month, but congressional hopeful Martha McSally reinforced her recent claim to victory by showing up in Washington for freshman orientation Monday. McSally, a Republican, holds a razor-thin lead over Rep. Ron Barber, D-Tucson, in the race for Arizona’s 2nd District seat in Congress. The two were separated by just 161 votes out of more than 220,000 ballots cast, a margin that is likely to trigger an automatic recount after ballots are canvassed Dec. 1. But McSally, who claimed victory on Wednesday, isn’t waiting around for a recount. After claiming victory Wednesday, she announced on Friday that Chris Shaefe would lead her transition team, and on Monday she showed up at the Capitol for orientation. Barber has not conceded and his office did not immediately return calls Monday seeking comment on either her victory claim or her participation in orientation. McSally was not available for comment Monday. But she said last week that it is now time to move on, according to statements from her campaign. “While we still have a recount to go, we expect similar results and will provide the necessary oversight to ensure accurate results,” she said. This is the second time McSally and Barber have squared off, with Barber squeaking out a 2012 victory by a margin of less than 1 percent. The 2014 elections brought the margin even closer, with McSally on top by 0.08 percent, according to the most recent numbers from the secretary of state’s office. “After nearly three years, some $20 million in ads, and two campaigns, it’s time to come together,” McSally said in her victory announcement. She added that she was looking forward to “rolling up her sleeves” and getting right to work. 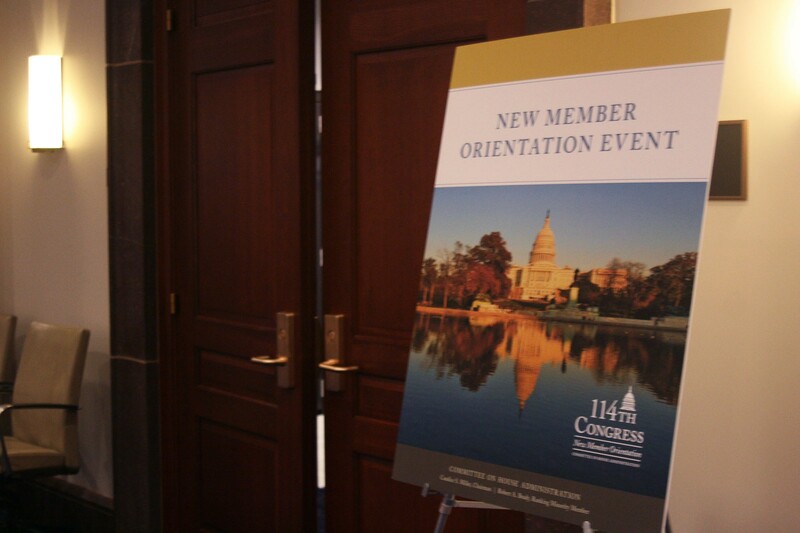 The first step for incoming members of Congress is the New Member Orientation program, organized by the Committee on House Administration, which helps incoming lawmakers transition into their new role. 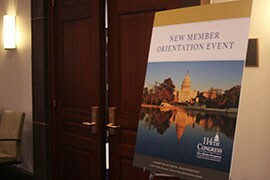 Orientation sessions began last week with sessions on ethics rules, hiring staff and planning for a move to Washington. The sessions have also included a dose of politicking by senior members seeking leadership positions. 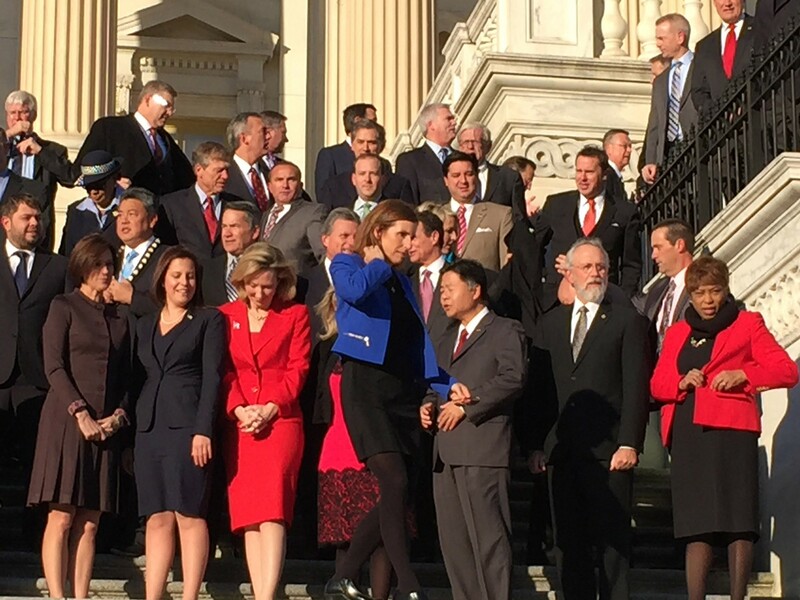 After attending Monday’s meetings, McSally joined the incoming members of Congress for the traditional freshman class photo on the East Front of the Capitol Tuesday morning. But committee staff said she will not participate in Wednesday’s lottery for Capitol Hill offices because of the recount. Instead, she would inherit Barber’s current office if she is ultimately declared the winner. 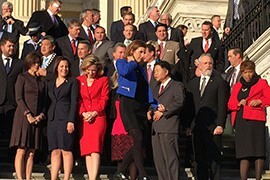 Martha McSally, in blue, joined incoming members of Congress for the freshman class photo, even though she still faces a recount of her slim lead over Rep. Ron Barber, D-Tucson. Arizona Rep.-elect Ruben Gallego, far left in second row, was also on hand for the photo. Republican Martha McSally's win in Arizona's 2nd District in Congress is not yet official, but she has claimed victory and joined incoming members for orientation at the Capitol.